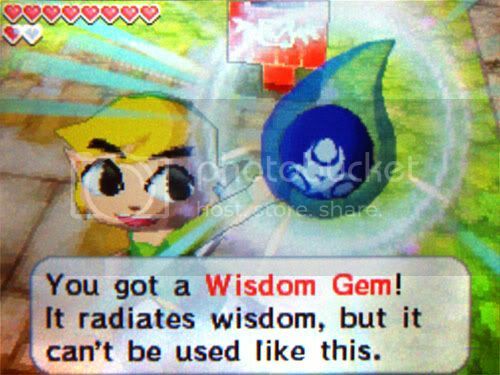 Phantom Hourglass happens shortly after the events of Windwaker. The game opens with a happy little storybook telling of Windwaker using cardboard cutouts, which is really cute. Link is now cruising the open sea with Tetra and her band of pirates. The come across a mysterious foggy ship and Tetra jumps on it with no regard for anything. When she screams for help Link jumps after her but misses and lands in the water. That’s the premise for the game and you spend most of it trying to get back on that ghost ship to save Tetra. I found the story to be very lighthearted, a lot like Windwakers was. It gets pretty serious towards the end, but for the most part it’s nice to play a game that’s not horribly dark and serious. Lots of smiles, lots of humor and just an overall happy game. The characters and their personalities in this game are great. Link of course is the silent protagonist he always is. The new character on the cover of the box is Linebeck. 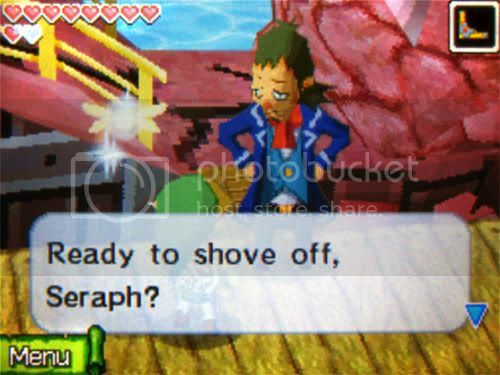 Linebeck is the guy who owns the boat you sail around on the whole game and “helps” you on your quest. I really love this guy. He is a greedy lowlife who only looks out for himself and always makes Link do all the hard work. His only goal throughout the whole game is to find treasure and become rich. He always runs scared whenever there is danger, but when the battles are won he shows up to try and take all the credit. Following the recent trend of Zelda games since Ocarina of Time, he is accompanied by a fairy that gives you hints throughout the game. Even the fairy has a likeable personality, always trying to help Link and fighting with Linebeck when he acts selfish. The main bad guy is new to the Zelda series, and was scarier to me than Gannon or Vaati ever were. I’ll leave it at that because I don’t want to spoil too much. Ending is cool to this game is pretty cool, especially the last battle. It gave off quite an epic “yeah we can do it!” feeling and after all was said and done I felt satisfied. The graphical style of this game resembles Windwakers cartoon style. That means Link is the big eyed short legged fellow that he was in WW. I liked this because I felt the cartoony style fits more with the old Zelda games I grew up with rather than the mature style of OoT and TP. 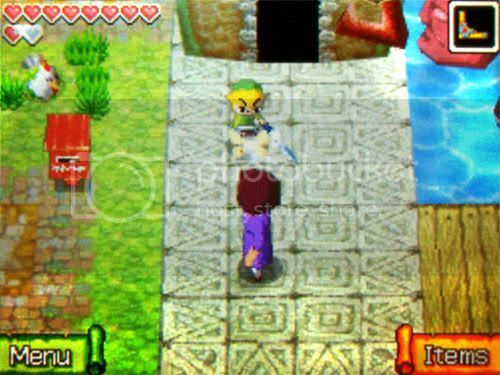 Also like Windwaker, the game looks cell shaded. I don’t know if it’s true cell shading or not, but it certainly looks like it to me. As far as 3D goes, this is some of the best the DS has to offer. From the standpoint of a DS game this game looks amazing, but when compared to the 3D titles we have grown accustom to on other consoles it looks blocky and jaggy. A lot of the reason the 3D looks so sloppy is because of the DS’s limited resolution. When the camera is zoomed out during normal play things look very sloppy, but when the camera zooms in on the characters it doesn’t look half bad. For some people this issue is a big deal, I personally didn’t have a problem with it. This games visuals obviously are not going to blow you away, it’s 3D on the DS, but the overall look of them has a charm and does its job fine. What I really love about following Windwakers theme is that this game is full of color. In a generation of games that strive for a realistic mature “brown” look, it’s so nice to see a game with bright blue skies and vibrant green grass. Much like the graphics, the music also takes a page from Windwakers theme. Fortunately while a few themes are taken directly from Windwaker in the beginning of the game, for the most part the game doesn’t remix songs for its soundtrack. The new soundtrack does a great job of retaining the Windwaker feel. The Overworld theme is really good and does a great job at sounding like sailing music, which is good because you hear it a lot throughout the game. I liked the cave theme because it reminded me a lot of LttP’s cave theme. Linebeck has a catchy theme as well, especially when it is remixed later in the game. Overall Phantom Hourglass doesn’t have a soundtrack as great as some of the other Zelda games, simply because there aren’t enough good tracks. There are some really good songs in this game, if there had been more then it would rank up there with the best. This game is controlled completely with the stylus. Everything from walking, attacking, and even menu navigation is all handled through the touch screen. There are no options for traditional controls, and this game was not designed to use them so it’s not even an option. If the thought of this really puts you off then I suggest avoiding this game. What I am very glad to tell you is that the touch screen controls work great. I was skeptical at first, because I wondered how a franchise as deep and involved as Zelda would handle without a D-Pad and multiple buttons. After about 10 or so minutes of practice the controls became second nature. Movement is handled by simply holding on the touch screen the direction you want to go. To attack you can either tap directly on the enemy to do a stab, or make a quick slash motion with your stylus to do a wide swing. Doing Links trademark spin slash is easier than ever, now you just draw a quick circle around him. All of it works great and is very responsive. The only action that isn’t would be rolling, as it worked probably half the time. Luckily rolling isn’t needed very often so it doesn’t hamper the gameplay. My only complaint with this control setup is not actually with the game but with the DS itself. I used a DS Lite to play this game and it becomes very straining to hold the DS with one hand for long periods of time. Regardless I loved the controls so much that I wish every DS Zelda from this point on would use this control scheme. It’s that fun. One of the biggest parts of this game is the new Ocean King Temple. It’s a temple with many floors that you keep coming back to throughout the game. As you get deeper into this Temple you come across floors that will drain your life and this is where the Phantom Hourglass comes into play. 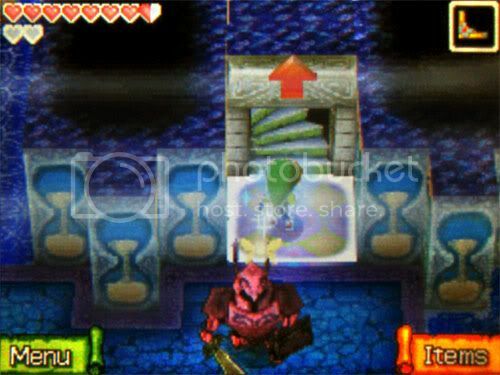 The Phantom Hourglass gives Link protection from the life drain, but only so long as it has time left in it. While I usually hate timed dungeons, this aspect didn’t bother me because unless you are screwing up really bad you have more than enough time to get to your goal. I mentioned that you do this Temple multiple times and this is because every time through it you can only go so deep before you are met with an obstacle that blocks your way. Usually the tools you find in the next dungeon allow you to go even further the next time through. Not only that, but your new tools will open up shortcuts on the floors that you have previously cleared so that you can knock a few minutes off the timer. The temple is filled with the invincible bad guys called Phantoms. When these enemies see you they chase after you until they lose sight or you step on a safe tile. If they end up hitting you they take off a full heart and a minute from your Phantom Hourglass. Much like the stealth mission in Windwaker, you must hide from these guys and sneak around their backs to get through. They are pretty stupid and easy to outrun, the only parts that I got caught was when I put myself in cornered situations by mistake. I thought this temple was a neat concept. At times it got annoying having to do the same floors over and over, but thanks to new tools opening up shortcuts it didn’t feel like that much of a hassle. This temple made getting certain tools throughout the game more excited because I would think “cool the bow, now I can see what those targets do in the Ocean King Temple”. Speaking of tools, Phantom Hourglass has some really creative ones thanks to the touch interface. For example the boomerang now allows you to draw its path on the touch screen, specifying exactly how you want it to travel. I thought the grappling hook was the most creative weapon in the game. Most of the time it works like the standard Zelda Hookshot, pulling you across gaps and reeling in treasure. But you can also use it to tie a rope between two posts and then use that rope as a slingshot for Link or his weapons. I’m happy that this game removes a lot of the annoyances I’ve had with the Zelda series. For example there is no Rupee limit now. I would always hate in previous Zelda games how I would open a chest and find a big pay out of Rupees (like 500 at once) and watch it all disappear because I was already at the max. Another thing they removed is Heart Pieces (or at least I think they did because I never found any). I never liked hunting down several pieces of heart just to add one more to my life bar. This entire game is easy, as in I only died once easy. If you like your games to be very challenging then this isn’t the game for you. I however don’t subscribe to the popular notion that every game has to be really hard in order to be fun. If that were the case I would never play a Kirby title. Phantom Hourglass is easy but all the battles, puzzles and exploration still provide a good level of satisfaction. I especially liked the puzzles that had you draw clues out on your map that eventually pointed to a treasure location. Throughout the game you find these teardrop looking gems that seem to do nothing. There are ones for Power, Wisdom and Courage. I read online that if you find every last one of a certain type than you can use them to upgrade your abilities. I thought this was kind of silly myself because some of the last ones are really hard to get and chances are you will have to use a guide to find them all. But I suppose for those who enjoy side quests its more to extend the life of the game. I have to applaud the pacing of this game. In most Zelda games I often hit points where I just don’t want to continue. Either the next dungeon or quest is really boring or time consuming and it makes me want to stop. I never felt like this in Phantom Hourglass, even with the Ocean King Temple. This is the fastest I have ever beaten because I didn’t want to take breaks. The other thing this game does right is the bosses. The bosses in this game are amazing. From beginning to end, every single boss is creative and a great finale to their dungeon. Phantom Hourglass has the best bosses in any Zelda game. 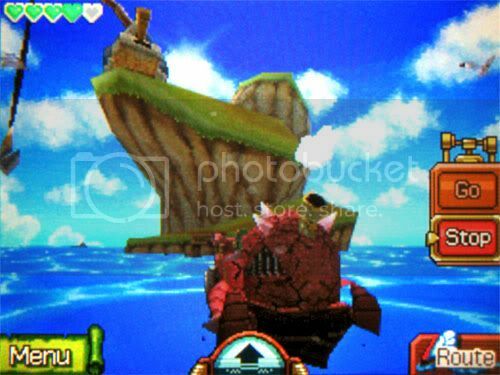 Like Windwaker before it, the entire Overworld is covered in water and you must sail to each location. Unfortunately due to the nature of this giant sea idea, there isn’t a lot to do while cruising on your ship. It does a better job than Windwaker, allowing you to draw the path you want your boat to follow and then sit back until you get there. But that’s the thing, sitting back and watching your ship gets boring. They tried to spice things up by throwing enemies at you once in a while but I found them to be more of an annoyance than anything. Sea Combat isn’t very fun either. Your ship has a cannon that will shoot at anything you tap at on the screen, which means all battles are so easy you wonder why they even exist. It’s not like normal combat where you have many other things to worry about like movement and items. You simply tap enemies and they disappear. The very end of the game has a sea battle that’s actually fun, and they should have put more battles like that throughout the game. At the main island you can customize your ship. Throughout the game you will find various ship parts you are able to mix and match to make an interesting looking boat. If you combine 2 or more of the same set the ships health will go up. I thought this was cool but they either needed to make parts more available or not make the requirements for more health so steep. In my play through I was only able to get one extra heart because in order to get anymore I had to have 5 pieces of the same set. What I loved about this game is that it felt like a made-for-handheld Zelda game. The design of it worked great in a pick up and play style, not forcing me to dump hours of my time into it at once. I always have trouble finishing the console Zeldas because of that very reason, and yet I beat this game relatively fast. I guess “Approachable” would be the right word. It gave off a very fun feeling much like Links Awakening did on the Gameboy. There is a multiplayer mode in this Zelda, but since I don’t know anyone who owns it I can’t talk about it. I finished the game in about 15-18 hours. That’s my estimate based off how long I played it a night and how many nights it took me to beat it. Being a Zelda game there isn’t much replay ability at all. Once the story is done I had no desire to immediately replay it. Again I can’t comment on the multiplayer because I have no friends. Phantom Hourglass is a great Zelda game, up there with my favorites. Well worth the full price of admission. I liked the new controls more than any of the older Zelda titles. Don’t buy it if you hate stylus controls. If you hear negative opinions of this game always take into account the tastes of the player they are coming from. I think this game rocks and was one of the most fun games I’ve played on my DS. 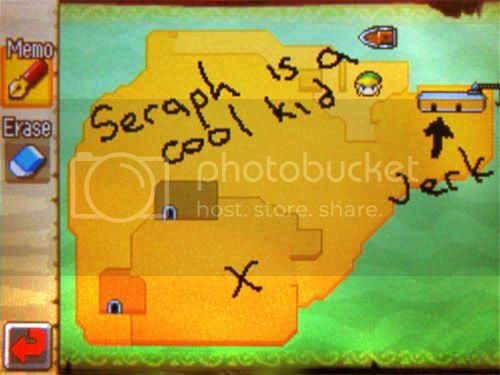 Last edited by Seraph; 08-04-2009 at 02:40 PM.